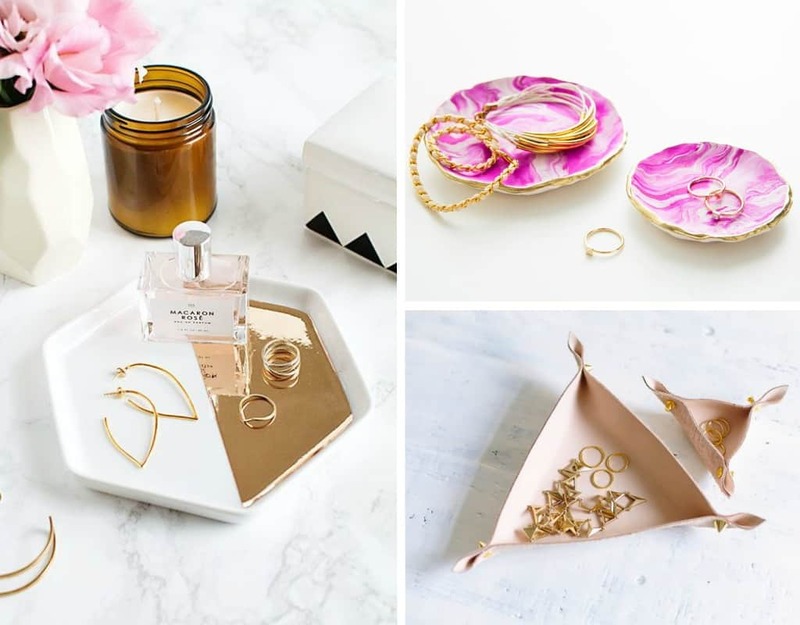 These easy and beautiful DIY jewellery trays will definitely make you want to try it! 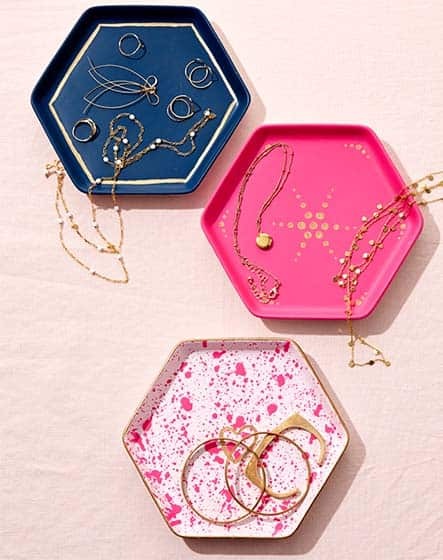 We all know that we never have enough trays for our jewellery. Especially when you always wear small jewellery, sometimes it’s missing if we don’t put it in a secure place. 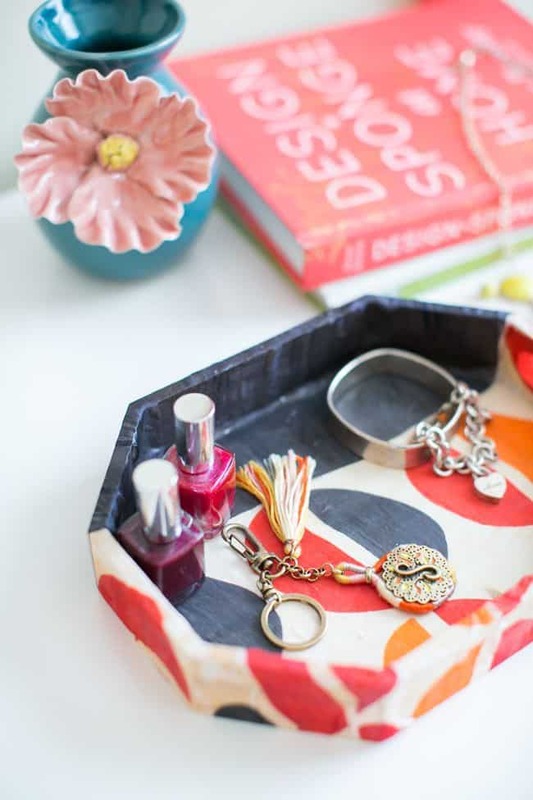 These DIY jewellery trays that I’m going to share with you is a PERFECT solution for that! Truth to be told is that I love, love, love tiny jewellery. Tiny earrings or rings are my favourite things to wear daily when I need to go out. The problem with tiny jewellery is it will be missed easily if I don’t put it in a secure place like a small tray. How many times I counted on the missing jewellery and it really makes me stressed (although it’s not a real gold, I do really love it!). So, I bet that you also feel the same when it happened to you. 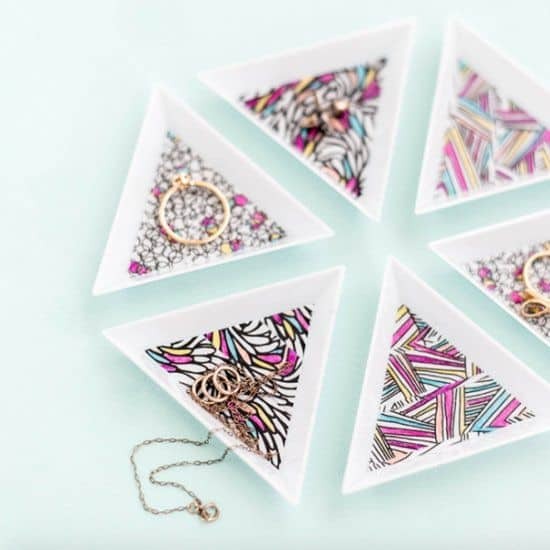 I found these 12 DIY jewellery trays that are easy to make so that you can put this anywhere you like such as in the bathroom near the sink or even bedroom. 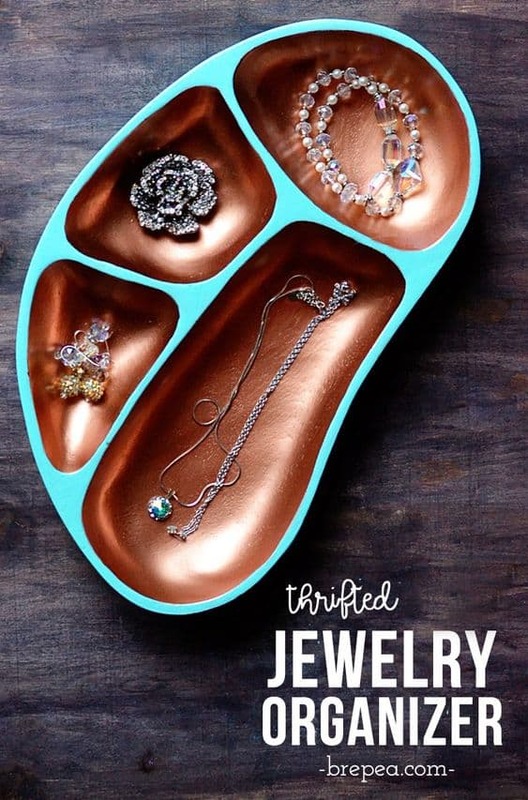 I always have a small tray for my jewellery in my bathroom just in case I want to go shower and I forget to remove my earrings. By having a small tray really helps me organize my jewellery well. This is the exact thing that I found on an online website that selling DIY’s stuff. 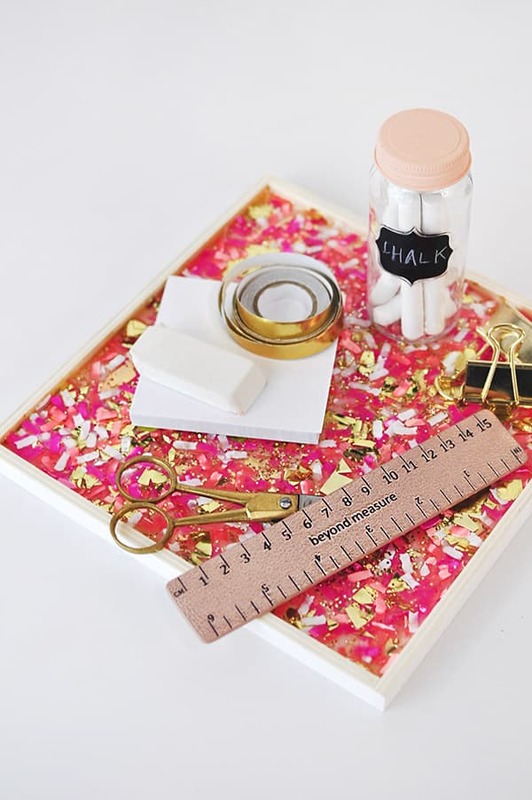 I found it very helpful because they’ll tell you exactly what you need to have in order to make this DIY jewellery tray. Or if you want to make it on your own at least you already know what you need to have to make this tray. Check out this DIY on Plaid Online. I love how simple and elegant this tray is! 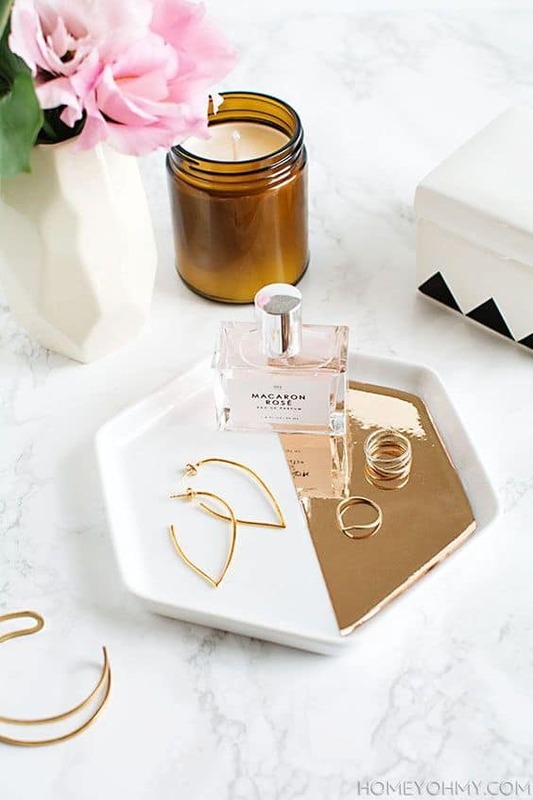 The gold mirrored finish is stunning and it paired well with white tray. It’s a super easy tutorial that you can follow from Homey Oh My. I just found out that you can make a lot of stuff from clay and jewelry tray is one of them. The tutorial is very detailed and you can definitely follow it even if you are a beginner. 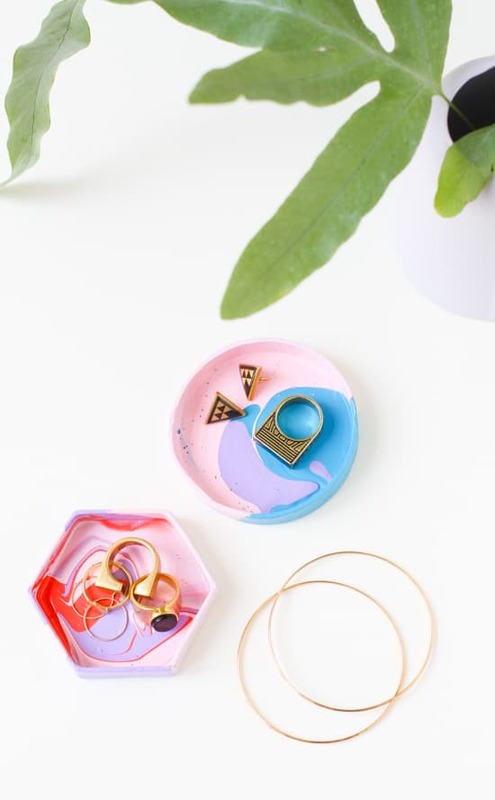 The material is not expensive but the result looks so expensive that you can actually sell it 😆 via Brit + Co. Buy one yourself an air dried clay here and make your own jewellery dish. If you found a tray that is plain white then you can decorate it with washi tape. There’s a lot DIY you can do with washi tape because it’s super cute and easy to incorporate! You just need to tape it and that’s it. You’ll get a beautiful tray! You can check out the tutorial on Craft Gawker. 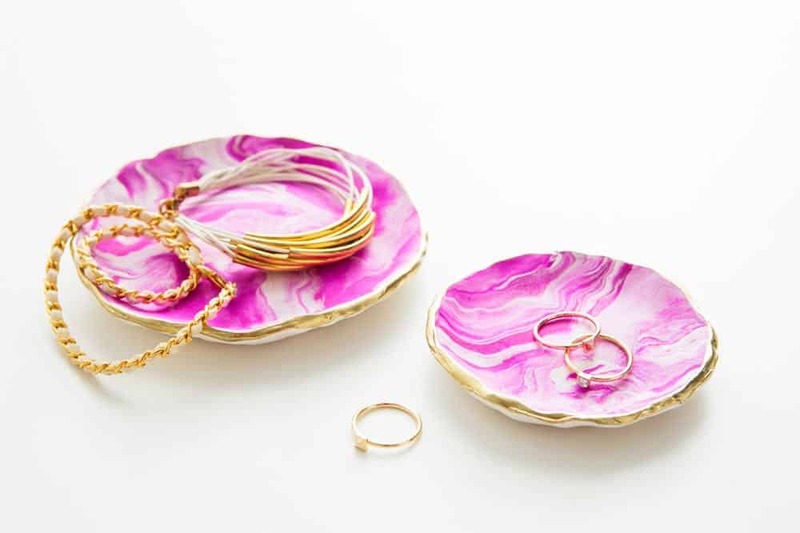 Who knows that you can make a jewelry dish out of leather? Well, I don’t. This is the first time I know about this and it really blows my mind when I first saw it. It’s simple to make and you can also change the leather to a thick fabric and follow the same tutorial from A Pair and A Spare DIY. Do you have old scarves that you don’t use anymore? Then this repurposes DIY is for you! What you need is so simple, an old scarf, Mod Podge, and a tray. You can do this for yourself or even better, do this as a gift for Mother’s Day! via Hello Glow. 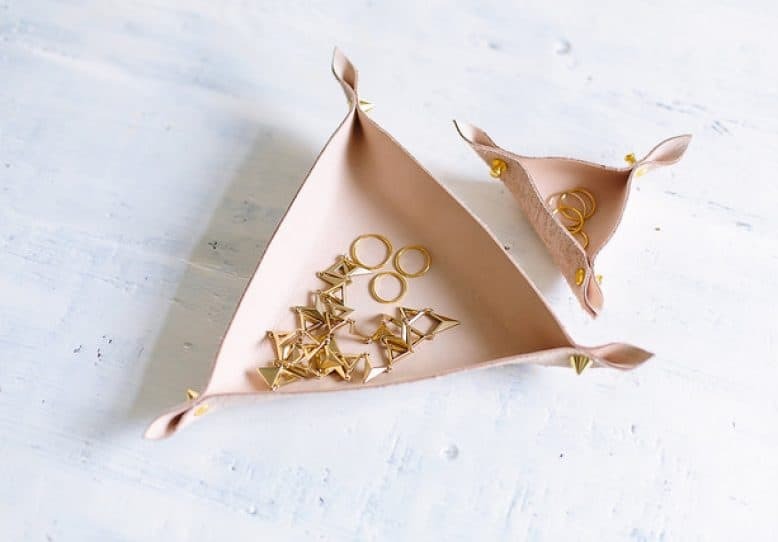 Make your own jewellery dish with a box lid via Paper and Stitch Blog. I really love the combination color of this DIY confetti Tray! 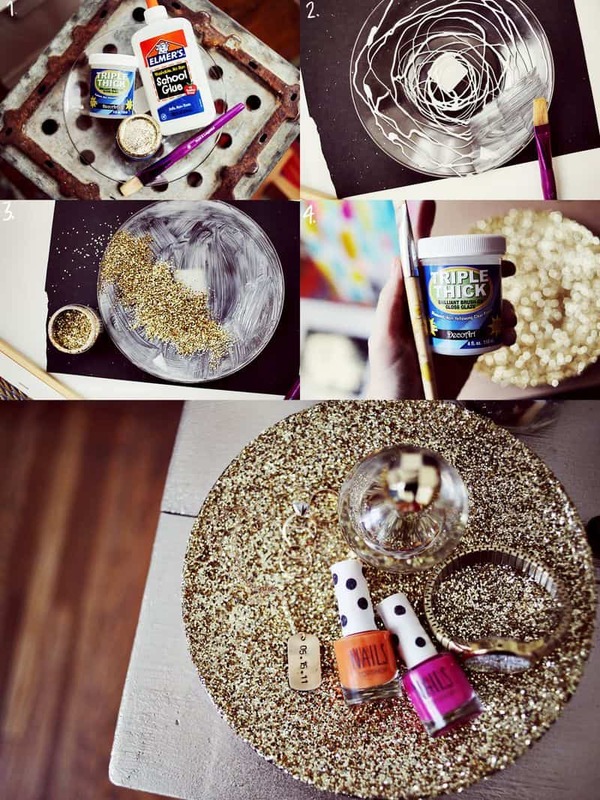 This DIY is easy to make and you’ll get a very pretty result in the end. Who knows that you make this by yourself and not buying it from a store? Well, I won’t. This also could be a perfect gift idea for your loved ones! Check the full tutorial on Delineate Your Dwelling. Who doesn’t love a cheap DIY idea? 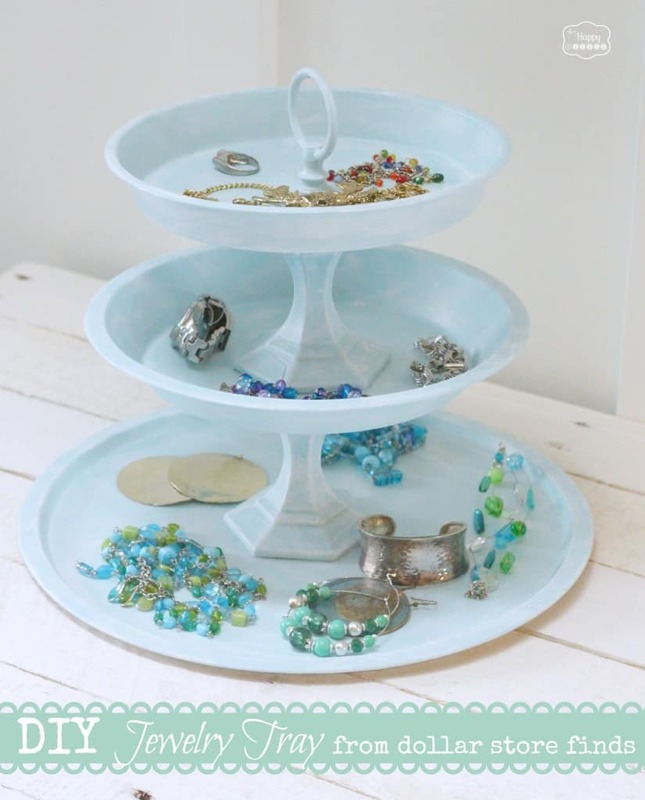 You can make this with the items from a dollar store and you’ll get 3 tiered jewelry tray! Wanna know how to make this beautiful tray? Check out the tutorial via The Happy Housie Porch. When you know how this tray made of. You don’t need to buy an expensive tray from stores. 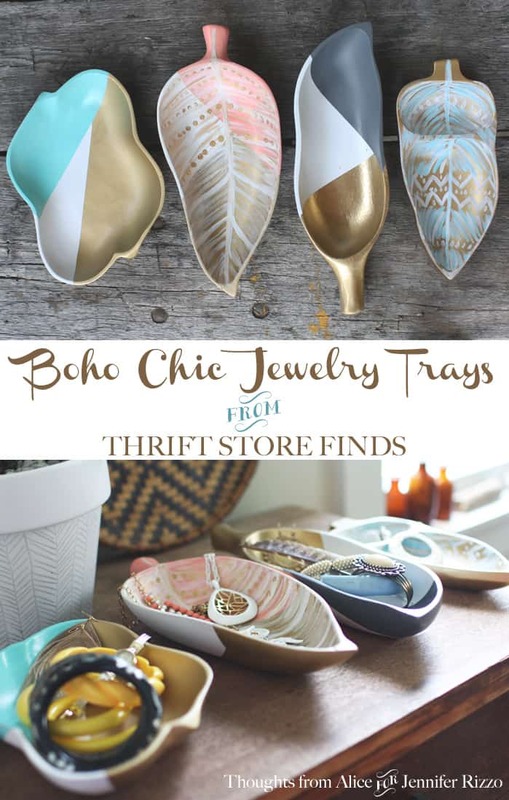 Instead, you can buy a tray from a thrift store and give it your own twist like these trays. It’s so plain before but now it’s pretty and colorful. I especially love the color combination! via Jennifer Rizzo. Another thrift store DIY! This one has a lot of places to put all kind of jewelry. You can easily do this on your free time and it will finish in a minute! via Brepea. Do you love glitter? Then this is perfect for you! Who doesn’t like an expensive stuff when you just need to spend a little to make it? Well, I do! This DIY is super easy and you can follow the tutorial via A Beautiful Mess. What I love from these DIY’s is that you can do all of these projects on the weekend if you don’t have anything to do. It’s definitely going to be a FUN thing to do! So, What do you think about my post? After looking to all of this beautiful trays, does it make you want to try it now? 😆 Let me know and leave a comment below if you have other ideas too! Join my mailing list down below to get this kind of post straight to your inbox!